Finish the college degree you started and graduate with an OSU bachelor's degree in one of Oklahoma's in-demand occupations while staying right here in Tulsa. OSU-Tulsa is part of Reach Higher: DirectComplete, a statewide degree completion program that connects adult students with the resources and guidance they need to finish their bachelor's degree. Studies show that with a bachelor's degree, you will earn on average $1 million more over your lifetime than with an associate's degree. With OSU-Tulsa's flexible class schedules and the assistance you'll receive through the Reach Higher: DirectComplete program, the higher salary, career opportunities and better quality of life that come with an OSU degree can be yours. That's because OSU-Tulsa students earn OSU degrees -- the same degree students receive in Stillwater. As part of Reach Higher: DirectComplete, you will have a team of professionals offering one-on-one guidance through every step of your OSU-Tulsa degree program. Your Degree Completion Navigator will be there to answer your questions as you begin the program and cheer you on as you walk across the stage at graduation. Your Degree Completion Navigator will work directly with you and connect you to staff and services to help you complete your Reach Higher degree program. Academic advisors will discuss degree requirements, course selection and sequence with you each semester, so you can stay on track to graduate. Financial aid counselors will help you complete the FAFSA each year and walk you through the financial aid process. Career Services will assist you with every step of your job search, including setting up OKJobMatch.com and HIRE System accounts. Kathy Williams knows what it's like to return to college as an adult. She started college at age 30, and now has bachelor's and master's degrees. 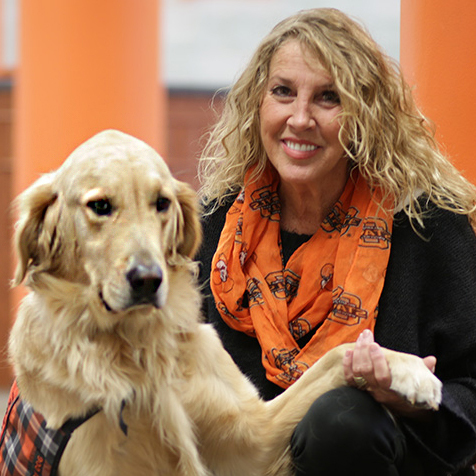 Kathy works in OSU-Tulsa's Prospective Student Services office, helping connect students with the degree program that will make their career dreams come true. If you visit her for an appointment, you might also see her Pete's Pet Posse Tulsa therapy dog, Sunny! Together, Kathy and Sunny work to make transferring to OSU-Tulsa a fun and exciting experience. Having trouble viewing the form? View it in a new window. When you submit this form, your information will be shared with the OSU-Tulsa Degree Completion Navigator and the Oklahoma Reach Higher: DirectComplete Program. Have questions or not sure if you're eligible for Reach Higher: DirectComplete? Contact our Degree Completion Navigator.